About 9.30 am we passed H.M.I. “Royal Edward” and at 9.45 am we received a message by wireless to say that she had been torpedoed, so we put back to her assistance arriving on the scene about 11 am where we remained until 3 pm picking up the survivors. What a scene it was there were boats right way, wrong way up rafts, wreckage of all kinds, barrels, hatch covers, etc, some even clinging to oars, some swimming. Poor mortals they had not much chance to prepare to leave their ship as she went down well inside five minutes. In one case we got about seven or eight men off a boat which had floated keel uppermost & when we got them alongside, they said they were two men underneath, we thought their wits had left them as they seemed scared. Well we got a line attached & with the help of a crane lifted one end of the boat, which was a steel one by the way, up a little out of the water, & sure enough we got two poor R.A.M.C. chaps from under. They had managed to get a little air through the plug hole in the bottom to keep them alive. They could not have lasted much longer, for the poor fellows were almost collapsed when got aboard which was a difficult job. The total number saved by the “Soudan” was 441. Everyone as they came on board was stripped naked, given a good rubbing, a hot drink of beef tea or Bovril, & wrapped up in a blanket & laid at one side. It was the time of our lives & everyone worked right well. We only lost two by death after bringing them on board. One we had performed artificial respiration on for over an hour, but it was too late. One body was believed to be J. P. Conway 2/2 E Lancs. Fld. Amb. About 3pm. we continued on our way to Alexandria with all speed. It will be noticed it was a Friday, 13th day of the 13th month of the War. Discharged Army Survivors of “Royal Edward” at noon after they had got a supply of Clothing and Boots, & they formed up on the quay side & didn’t they look a sight. Each remnant of a unit formed up by itself & you could tell where the blanks were by this means. It impressed us all. Well as they marched past the “Soudan” they gave rousing cheers, which were answered by us & also some neighbouring ships. Went ashore 4 till 11 pm. 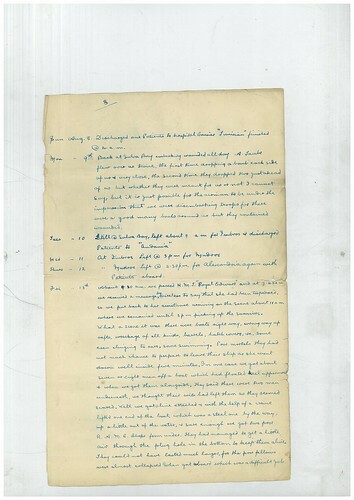 These extracts are from Arthur Sanders’ handwritten account of his war service on the hospital ship, The Soudan. Lesley Oldham, one of the volunteers at GMCRO, is a member of the RAMC and the TA. She recognised his account as a significant eye witness description of an event that is still the biggest loss of life for the RAMC. It also has particular significance for Burnley, as many of the men came from that Lancashire town. We have shared this discovery with Burnley’s Great War website. It brings home the reality of war with a strange mix of sadness at the loss of life, and excitement at the discovery in the archives. Arthur Sanders’ diary notes will be featuring in future blogs. He was there at Gallipoli. He visited Cairo and Alexandria. He is writing as a young man, experiencing not only the action of war but also his first introduction to a different culture. Thank you for publishing this diary entry. My father was one of the 441 rescued by the Soudan and may well have been one of those on the upturned lifeboat mentioned by Arthur. The year was 1915 by the way rather than 1917. I can’t imagine what it must have been like for them. Your father must have been incredibly brave. Thanks for your comment and spotting the mistake! We’ve put it right now.